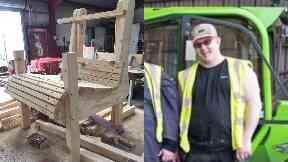 Wood RecyclAbility employs people with additional support needs in Aberdeenshire. For Scott Gilmour, work is more than just a job, it's a lifeline - but one that is under threat. After a car accident left him with learning difficulties, he's found a sense of purpose again thanks to Wood RecyclAbility. Tucked away in a quiet corner of the Aberdeenshire countryside, the social enterprise was founded in 1997. For the past 21 years, it has provided work placements for adults with additional support needs. Every afternoon, trucks weave in and out of the workshop's yard, offloading discarded wood. From there, the battered and weather-worn planks, panels and pallets are transferred to the workshop where they're carefully crafted into pieces of art by people such as Scott. But now Wood RecyclAbility faces an uncertain future, as supplies are running dangerously low. "All my friends are here, and I just love it," says Scott. "I couldn't have wished for a better place, it's brilliant." Morale remains high amongst the dedicated workforce, but with stocks dwindling, it's clear that times are tough. An urgent appeal for help has now been launched by the Pitmedden-based company. "Maybe you can't give us 60 tonnes of wood a month, but maybe you can give us five or ten tonnes," says chairperson Elinor Smith. "Help in any way would be very much appreciated. "You're not just helping us in terms of the company - you're really making a huge difference to the lives of a lot of individuals." Finished products, including furniture, wildlife and bird tables are sold off. Operations manager Brian Reid says: "We're appealing to local businesses, particularly in those sectors which produce a large amount of wood waste, to contact us and allow us to take this material off their hands. "This can include pallets, crates or scaffolding boards. "By providing us with this material you are preventing it going to landfill and also allowing us to continue to provide a vital service for vulnerable people across Aberdeenshire." If you think you can help, please email info@shopwood.co.uk or call 01651 842876.